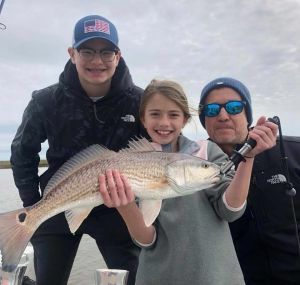 The Fishing Report for Galveston Bay has been consistently good between the frontal systems and the rain fall they are carrying with them. 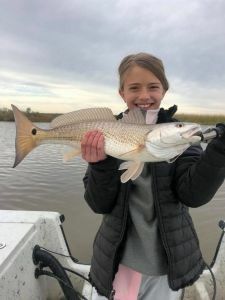 The red fish bite has been good in the back lakes and marshes. Some speckled trout have been sprinkled into the boxes, but red fish has been the major catch. Moving around and fishing different depths is the main key this time of year. One memorable trip this past week was with Dr Lee and his family out for a double boat half day Galveston Fishing Charter. The red fish and speckled trout cooperated well. All the fish were caught using live mullet fished in 3 to 5 foot of water – shell and mud bottom. It was a cool-crisp morning, but this group caught fish the entire trip. Another great trip was a catch and release trip with the Robinson Family. 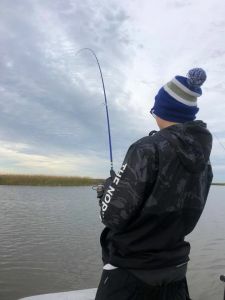 Brad fished with us this past summer on a Galveston Jetty Fishing Charter, and he came back for a winter time back lake marsh trip. Some folks just have good mojo and the stars align… this was the case for Brad and his kids. 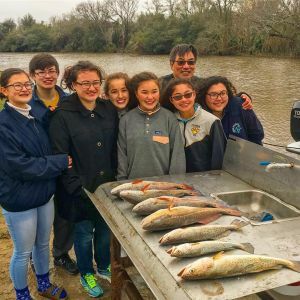 They fished the last day of 2018 with Captain Greg Jr, and the first day of 2019. They caught and released numerous nice slot reds. Captain Greg Jr was fishing 3 to 7 foot of water using live mullet. Most of the areas were adjacent to deeper channels with mud bottom. 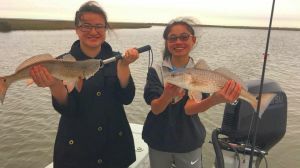 January and February are great months to fish in Galveston. The back lakes and bays hold real nice red fish and speckled trout this time of year. You will not catch allot of small fish, and the fish that are caught are generally very good size. The Galveston Jetties are already seeing some nice BaySnapper, aka Sheepshead showing up along the rocks. The BaySnapper bite will only get better as we near towards spring time when the full out spawn will take place. Also, along the Galveston Jetties we are catching redfish, speckled trout and black drum. If you are looking for a great winter time activity, give us a call. Winter time fishing in Galveston can be amazing. Also, remember we have water front lodging at Bay’s Landing. Give us a call and ask about our lodging/fishing special packages and let’s go catch some Big Winter Time Fish!